There was great support on the day and Tubes Scaffolding once again won the sponsored football match. The raffle prizes and auction lots were donated by suppliers and we would like to thank everyone who gave so generously and for all who attended on the day to help us raise a magnificent £2000. Vanessa said this could pay for four hours of end of life care and provide for eight hours of music therapy or provide essential care kits for our nurses to provide care in families homes. £400 was also donated to Parkside School, Norwich. 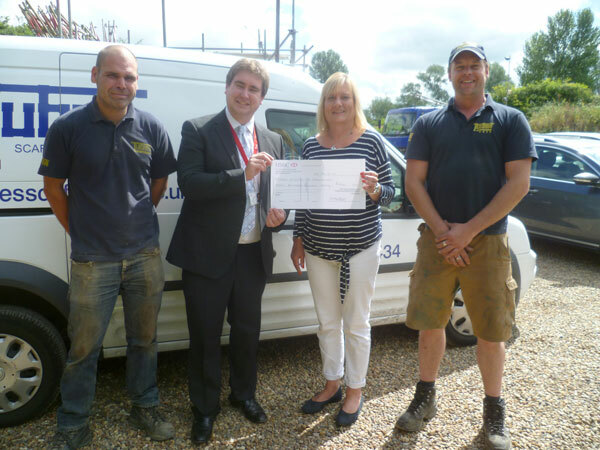 Opposite - Teresa Farman presenting a cheque for £800 to Oliver Larking, East Anglian Air Ambulance, with two of our scaffolders, Ian Bargewell and Mark Jones. 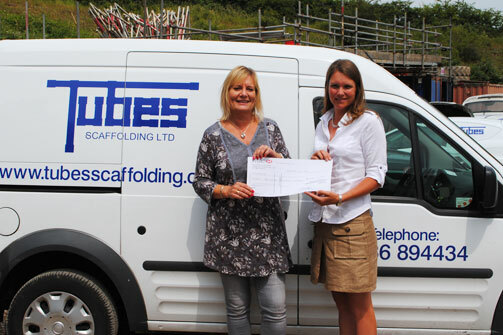 Below - Teresa Farman presenting a cheque for £800 to Vanessa Bell, Suffolk Fundraiser of East Anglian Childrens Hospices.